Impasse broken over pay raise for First Caribbean workers? Posted: Saturday, January 23, 2016. 7:20 pm CST. 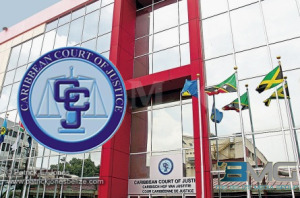 By Aaron Humes: While it was not held in open court, the Caribbean Court of Justice (CCJ) has received its promised reports from the Maya Leaders Alliance and Toledo Alcaldes Association (TAA) and the Government of Belize on the progress of implementing the consent order agreed to by both parties in a historic judgment delivered last April. But only a few months afterward, on the heels of the confrontation between Maya villagers of Santa Cruz and African descent resident Rupert Myles, the Maya contacted the CCJ, accusing the Government of dragging its feet on the issue. In the weekend edition of the Amandala, Senior Counsel Denys Barrow, Government’s attorney for the case, told reporter Adele Ramos that the Toledo Maya Land Rights Commission is now established and must be left to do its work. That work includes meeting formally with the Maya, which according to program coordinator for the Maya Leaders Alliance Pablo Mis, is the most important assurance yet from the Government that their grievances will be settled. The Commission is chaired by former Senator and Minister of Government Lisel Alamilla and staffed by senior public officer Noreen Fairweather and Crown Counsel Randolph Sheppard, with noted international attorney Anthony Ross, Queen’s Counsel, acting as consultant. According to Mis, the Maya have yet to actually hear from the Commission, which is setting up its offices in Punta Gorda Town; however, he expressed the hope that the Commission will have true authority to advance the practical issues raised in their planned dialogue. The Commission was of the view that much of their success, if any, over the next few months and possibly years depends on how each side views and contributes to the process. Ross said at their press conference a week ago that the Commission’s role is defined by the Maya’s concerns and it would not force its views on them, while Alamilla told us that while the exact model they will use is not yet clear, there will at least be some public meetings and they will also include other ethnic groups living in the district, which share and in some cases compete for resources with the Maya.